Food Network’s Can O’ Beer Cake – This Girl Loves to Eat! The named the recipe didn’t entice me, but the picture sure did! The tiny air pockets in the cake, the luscious glaze and the dark cherry compote look too good to pass up, so this is definitely gracing my next dinner party table! Preheat the oven to 350 degrees F and spray a 10-cup plain Bundt pan with nonstick baking spray. Whisk the cake mix, oil, eggs and 1 cup beer in a large bowl until smooth and well-combined, at least 30 seconds. Pour the batter into the prepared pan, smoothing the top with a rubber spatula, then bake until a cake tester inserted in the center of the cake comes out clean, 45 to 50 minutes. Meanwhile, pour 2 tablespoons beer in a heatproof glass bowl and microwave until hot, about 30 seconds. Stir in 2 tablespoons granulated sugar until dissolved. Let the cake cool in the pan for 5 minutes, then invert it onto a cooling rack. 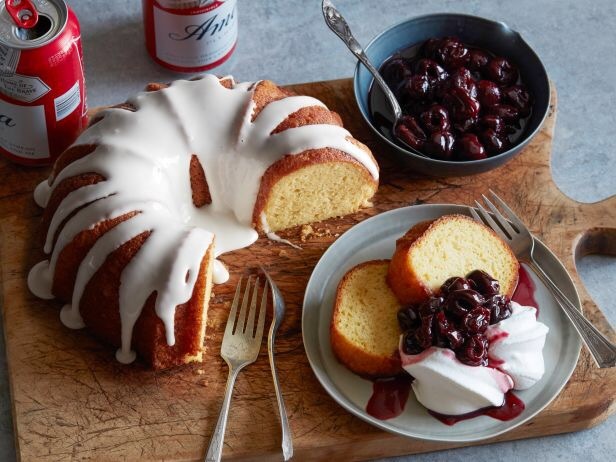 Using a toothpick, poke several holes over the cake, then drizzle the beer syrup evenly over the cake until it soaks in. Let the cake cool completely. Stir the confectioners’ sugar and 2 tablespoons beer together in a bowl until smooth. Add more beer, 1 teaspoon at a time, as needed to form a thick glaze. Drizzle the glaze evenly over the cake and let stand until set, about 10 minutes. Meanwhile, combine the remaining beer and 2 tablespoons granulated sugar with the cherries in a medium saucepan. Bring to a simmer over medium heat and cook, stirring, until the cherries are warmed through and the liquid is reduced to a thick syrup, about 10 minutes. Transfer the cherries to a bowl and let cool completely. Serve cake slices with the cherries on the side and a dollop of whipped cream, if using. Posted on January 29, 2017 by ls1228Posted in Baking, Booze, Celebrations, Dessert, Party Food, RecipesTagged beer, cake, Can O'Beer Cake, Cherry Compote, dinner party, Food Network.